Disclosure- I received a free coupon and several $1 off coupons to try this dessert out. All opinions are my own. eating better! How dare you create these delicious dessert mason jars! You are just adding fuel to the flame! LOL! 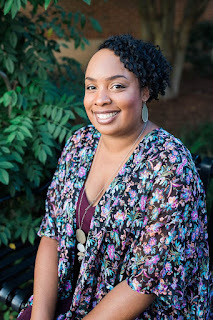 Well I had a choice to do this bzzcampaign from BzzAgent.com and without hesitation I quickly accepted when I got the email to review Kroger's newest mason jar desserts. Gosh, mason jars are everywhere! People are using them for juicing, desserts, salads, dips, pretty much anything! I guess Kroger had to start jumping on the mason jar bandwagon too. BzzAgent sent me a free coupon and several $1.00 off coupons so I could try out these scrumptious desserts. I headed to my local Kroger and cruised my way to the fridgerator dessert aisle next to the bakery. I had two desserts to choose from that was currently available: Salted Caramel Cheesecake and Chocolate Ganache Cake. 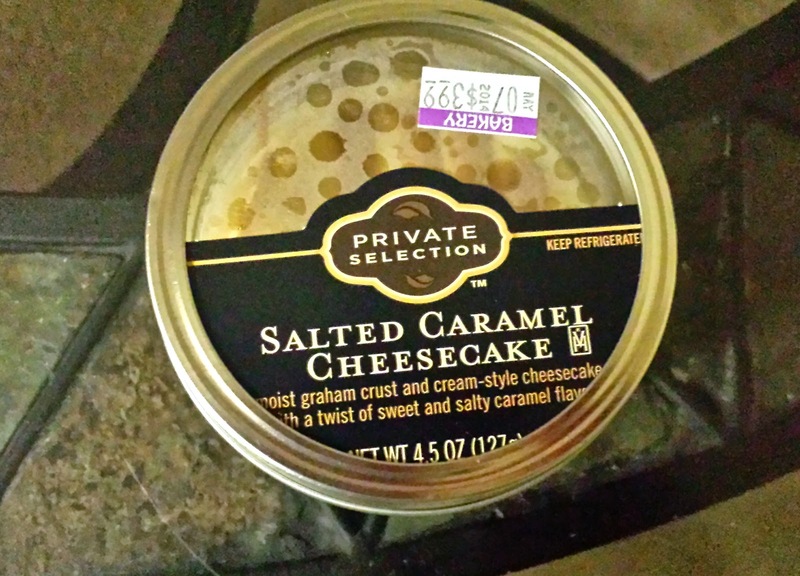 If you know me, you already know I don't like chocolate cake, so that left me to purchase Salted Caramel Cheesecake. I have no complaints purchasing that because I happen to love cheesecake and caramel too! I had my daughters along with me at the store and purchased them both a cheesecake jar too. Once we got home and settled in, we all dived into our desserts and oh boy was it good! I couldn't put it down! I ate every crumb of it! Taste just like homemade cheesecake! It was rich, creamy, delightful! 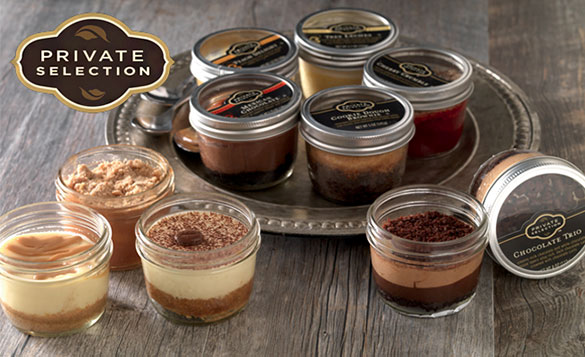 Using innovative ingredients, New Private Selection Mason Jar Desserts are for a dessert that won't disppoint. 10 fantastic flavors- Chocolate Ganache Cake, Chocolate Trio, Cherry Crumble, Salted Caramel Cheesecake, Peanut Butter Chocolate Brownie, Tiramisu, Apple Crumble, Peach Delight, Tres Leches and Mexican Hot Chocolate. With no need to thaw or heat, you can enjoy immediately. Unique mason jar packaging helps create the prefect gift. Locate each treat in the bakery, either in the refrigerated section or on the display table. After you indulge, get crafty on your own by putting these artisan mason jars to work in your next at-home project. After all, you’ve got to have a proper meal before you dive into dessert, right? Everyone loves a good burger, but did you know you can earn an extra coupon for a free Private Selection Mason Jar Dessert simply by sharing the secret behind your grilling greatness? 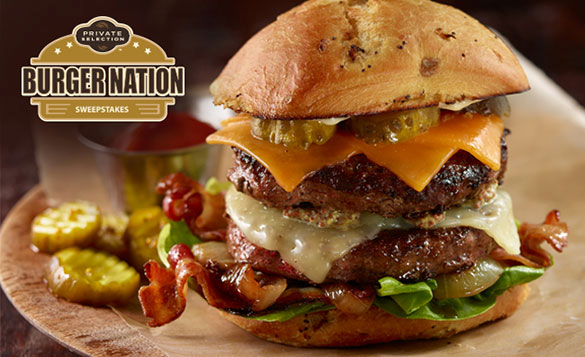 Visit the Private Selection Burger Nation Sweepstakes where you’ll receive an additional coupon for submitting a photo of your best burger. Not only that, but you’ll be entered to win a new Summit® E-670™ LP Gas Grill from Weber®. Share your burger on Facebook, Twitter and Pinterest for more chances to win a grill makeover and tell friends to send in their photos, too! Enter the Sweepstakes now! Is Kroger's Private Selection Mason Jar Desserts Worth a Try? Most definitely yes these desserts are yummy and a prefect Summer time treat, well at least the cheesecake ones are since I haven't tried out the others, but I'm pretty sure they're all good. I love the fact that I have a reusable jar that I could store dips in or maybe use as a plant project with my girls. Price of these desserts are $3.99 each which is not a bad price considering the reusable jar. Have you tried out Kroger's Private Selection Mason Jar Desserts yet? I have not heard of these until now. Sounds like something for me to try. Raw food fast! Girl now that's hard! Good luck with your fast! My husband bought one of those last week and he liked it too! I'm trying to kick my sugar habit too, so I didn't try any. You're stronger than I Sonya because I always cave in. We don't have Kroger's here in Massachusetts, which is a bummer because I could totally sit down and eat about a dozen of those right now! You never can just eat one Robin! Hehe! ugh. THat burger looks DELISH! Add extra pickles to mine and serve it up! I've seen these and hope to snag one the next time I am in a city that has a Kroger.. they look so cute and so darn cute. Salted Caramel Cheesecake ohhhhh yummmm. I love anything in a mason jar. Those desserts are adorable. Oh, Louida. Now why did you have to do this review? Are you going to come to my home in the dead of the night when my sweet-tooth strikes and pry this jar(s) out of my hands? Because that is surely what I will need. LOL Courtney! Sorry girl! These desserts are too good not to talk about. We don't have a Kroger's where I am but those look amazing!! 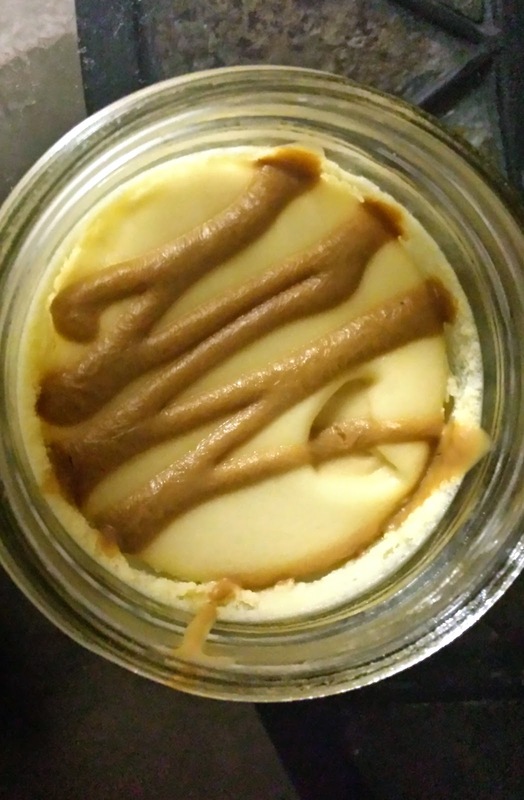 Cheesecake in a little mason jar is just perfection to me! I love anything in a mason jar! These are too cute- I bet they taste phenomenal! I haven't tried these, but they sure are cute. I'll have to look for them when I can eat dairy and gluten again! How have I missed these?! I always shop a Kroger! I will have to cheek them out now! I'd have to get one in every single flavor, I know it. They look so good! I didn't know abut these desserts from Kroger! I see quite a few flavors I'd like to try. Wow, these look tasty. Unfortunately there is no Krogers in my area. These desserts look so good! I like that they are portioned out for you. Anything coming in a mason jar is dangerous! These look delish! Those look amazing! I wish I had a Kroger near me. Not only do these look delicious, they're really cute too. How fun! Wow! Now these are too cute! I love the mini mason jars! Love the personal size! Well, personal for most people, I'd probably need two. I think these jars are just adorable! We love Kroger! I'll take a salted caramel cheesecake PLEASE! Those are so adorable! Yummm, salted caramel. I love all things salted caramel..
Those look sinfully delicious. At least they're divided into small portions, so it's not like buying a giant pie. Oh my! I just think I added 10 of these to my Kroger list! They look so good. And the jars are way too cute! Ohh...I haven't seen these yet in my Kroger! I've got to check them out. I love little mason jar desserts cause it keeps me in check on portion control. My sweet tooth is HUGE! Those look so good! I order those types of desserts when we eat out at restaurants - fun that they have brought them into our freezers! those are so precious. I love anything in a jar. oh my....now I need something sweet! Mmm hmmm hmmmm. I've tried the chocolate ganache. It was good. I'd love to try the salted caramel cheesecake! Those look so good! I love how they are conveniently packaged. Those look delish! I would love the chocolate ganache! I have not heard of these desserts before and now I want my friends in Atlanta to go to the market and send them to me! Oh how cute! Those would be awesome for when I have to bring something to lunch playdates. These look so decadent!!! I wish I had a Kroger near me! I've never tried these before but sadly no Kroger close by. :( That cheesecake looks delish!! These not only look great, but they also make for a great upcycled craft when they are finished! I tried the apple crumble it was oh so good. I plan on getting me some more soon.